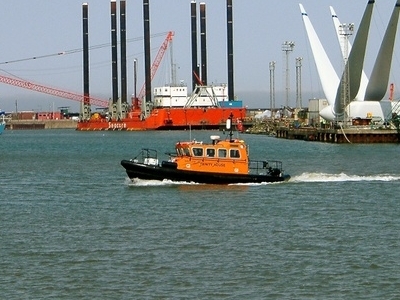 The Port of Lowestoft is a harbour in Lowestoft in the English county of Suffolk owned by Associated British Ports. It is the most easterly harbour in the United Kingdom and has direct sea access to the North Sea. The harbour is made up of two sections divided by a bascule bridge. The inner harbour is formed by Lake Lothing whilst the outer harbour is constructed from breakwaters.Traditionally the harbour was the site for an extensive fishing industry as well as engineering and shipbuilding companies such as Brooke Marine, Richards and Boulton and Paul. The offshore oil and gas industry has also operated from the harbour with Shell maintaining their Southern Operations base in the harbour from the mid-1960s until 2003. Although the offshore industry remains important, many of these industries have now declined substantially. In the modern era the port is attempting to develop as a focus for the renewable energy sector. 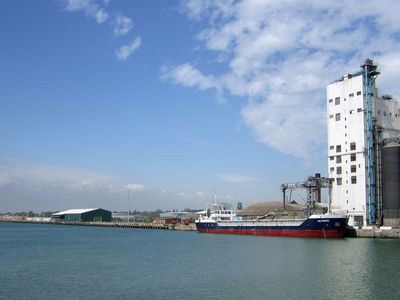 The harbour is the focus for redevelopment proposals for Lowestoft in the form of the Lake Lothing and Outer Harbour Area Action Plan submitted in February 2011. The plan focusses on the redevelopment of brownfield sites in and around the harbour area to create jobs, particularly in the renewable energy and retailing sectors. The port's main entrance can accommodate vessels up to 35 metres in width, with vessels 22 metres wide being able to access the inner harbour through the Bascule Bridge. [ The harbour is able to service vessels up to 125 metres in length. Modern transit sheds and a 14,000 tonne silo are available with a range of cranes and other facilities including a container terminal. There are also facilities for ship repairs, including a dry dock and a number of slipways. Mutford Lock links the inner harbour to Oulton Broad from where Oulton Dyke provides access to The River Waveney and Broads system. Here's the our members favorite photos of "Ports and Marinas in Norwich". Upload your photo of Port of Lowestoft!